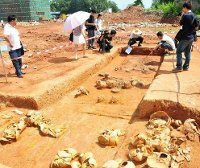 During the excavation of a recently discovered Eastern Han Dynasty grave, the Guangzhou Cultural Relics Archaeological Research Institute has discovered a pile of more than 1,000 bronze coins. The coins have the inscription “da quan wu shi” (大泉五十) which means “large coin fifty”. These large coins were worth the equivalent of 50 cash coins. They were cast during the reign of Wang Mang who usurped the throne and ruled during a short period (7-23 AD) between the Western Han and Eastern Han dynasties. According to the report, this grave is one of the best preserved Eastern Han graves having an abundance of bronze objects that has been unearthed in recent years. The grave is 8.2 meters long and 5.02 meters wide. In addition to the coins, the grave also contains nearly 100 other objects including a bronze mirror, pottery, colored tile as well as ornaments and jewelry made of jade and agate.